A really moving story, I loved reading it. I really hated the ending it was really tragic. But the rest of it was good. Love this book but very sad!!! HI I loved My Sister Jodie. It was very dramatic and drastic. My favourite character is Pearl, Jodie and Harley. I hated Jed, despite he’s so cool and casual he’s a total JERK!!! This book is sooo good I could read it all the time. 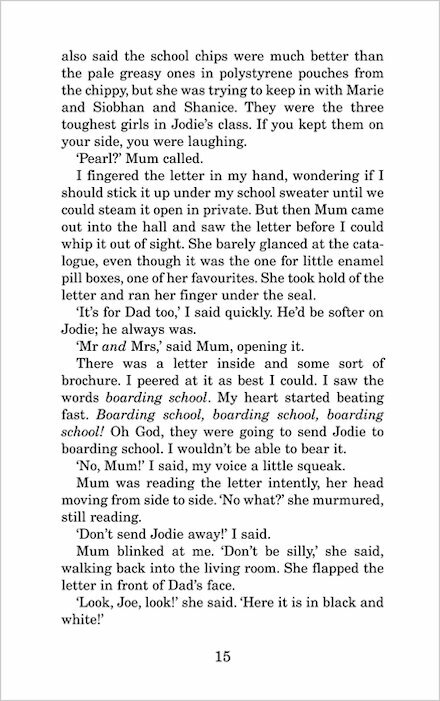 Everyone should read Jacqueline Wilson is such a good author. Her books are so good, they explain about every day life. They make you feel empathetic and sympathetic. A brilliant book, but it has some very sad bits. It brilliant, Just brilliant. It made me cry though. I love it. Good job Jaqueline Wilson! My all time favorite book. 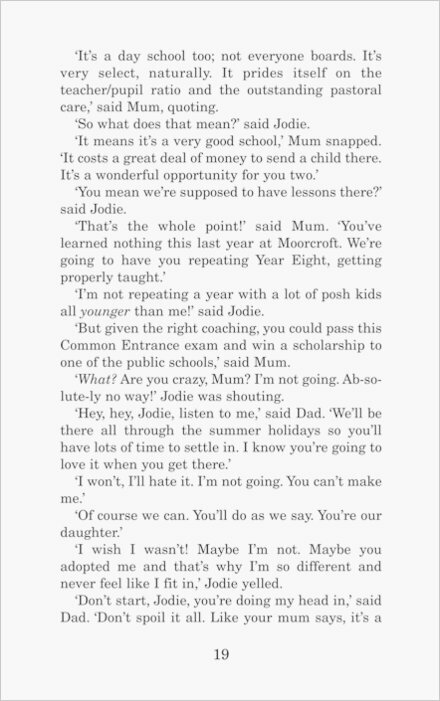 This book still brings tears to my eyes when I read it, after more than 2 years after first reading it. No book can be as lovely as this one. Sad and captivating story. Recommended fro everyone. This book is so touching. I cried from when Jodie falls till the end. This book was amazing. It kept me entertained and wanting more. It was really interesting. I was shocked at the loss of the main character also. Definite Reccomendation. I thought it was AMAZING!!! bUT it was sad at the end. exciting, funny, interesting, with a sad twist at the end – a great book! I love it but I still can’t get over the end. 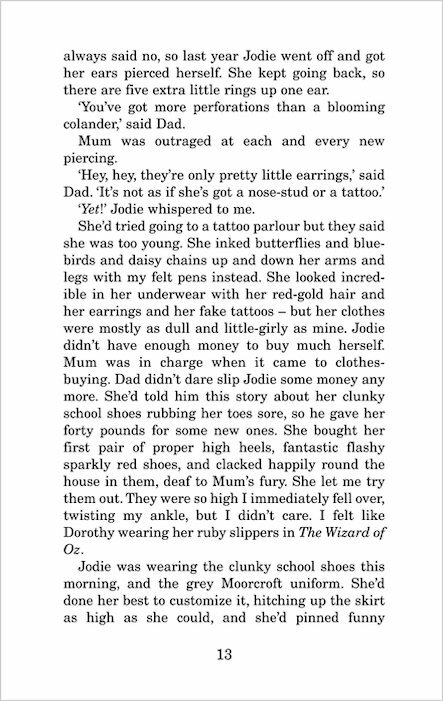 My Sister Jodie is my favorite book ever! Though its very sad. I cried for ages when I read the book. I felt very sorry for Pearl. Pearl wanted her stories to have a happy ending. But she didn’t have one. I’m a happy ending girl myself! 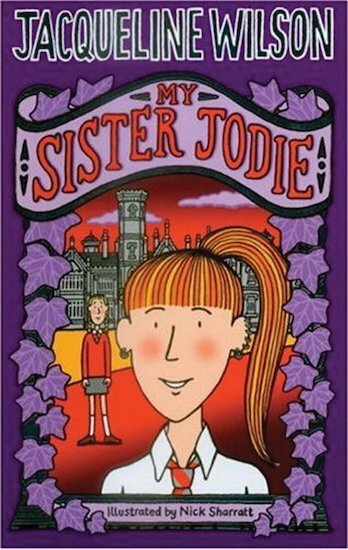 But My Sister Jodie is the best book ever! This is my favourite book ever it is the the best book in the world even though it doesn’t actually have a happy ending. Anyway I’m not a fan for happy endings anyway. Awesome book!!! 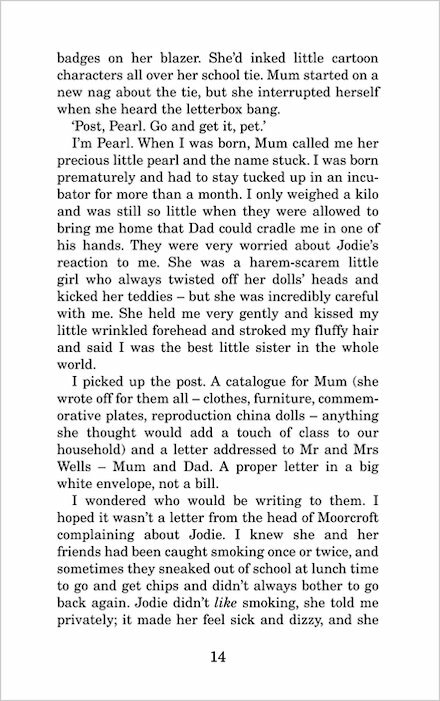 Though Pearl wants all her novels to have happy endings it doesn’t seem she has! But now as she will be the big Sister maybe it won’t be so sad. I hated when Jodie died because she is soooo much like my sister Sammy! Awesome book!!! Though Pearl wants all her novels to have happy endings it doesn’t seem she has! But now as she will be the big Sister maybe it won’t be so sad. I hated when Jodie died because she is soooo much like my sister Sam!! This is a great book, but its really sad at the end. It reminds me of my sister, I think Jodie’s hilarious. This is a beautiful book. I love it to pieces. I don’t want to spoil anything but all I’m going to say was that it isn’t the happiest book. It makes you laugh and CRY and I love it. Hint hint have a box of tissue near you when you read this. IT IS A FABULOUS BOOK!!! WARNING FOR SOFTIES IT IS A REALLY CRYING STORY ESPECIALLY AT THE END.YOU WILL CRY BUCKETS!!!! A SENSATIONAL FIVE STAR FROM ME! This is a really good book. Jodie is Pearl’s sister and she is always getting into trouble. Jodie and Pearl move to Melcheser College. Pearl is happy there but Jodie isn’t. She gets bullied by the rest of the 8th grade, she is really cheeky to her teacher but she is good with little children. When Jodie does something, really, really, really, really, really bad to herself involvling a tower, Pearl crying and the whole school, the family is never the same again! The language in this book is really discriptive so I would advise you not to read it before bed! My favourite part is when Jodie does the mysterious bad thing. Sorry I can’t tell you, because that would be telling too much. There are way too many characters for me to tell you about so I will just discribe the main ones. 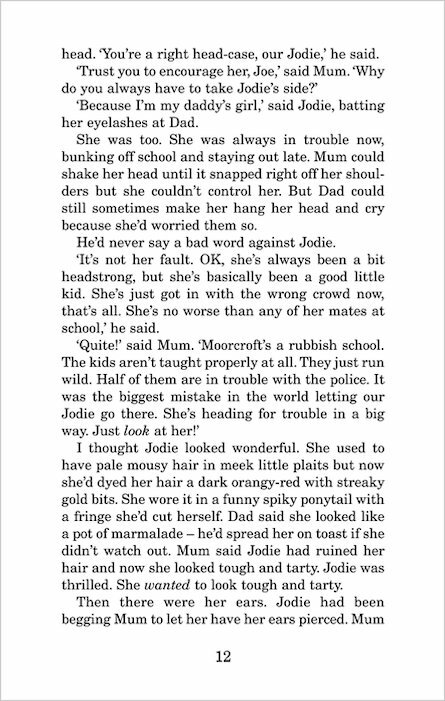 There is Jodie who is adventurous, Pearl who is good at making friends, Harley who loves badgers, mum who gets really irritated and dad who calls her his princess. 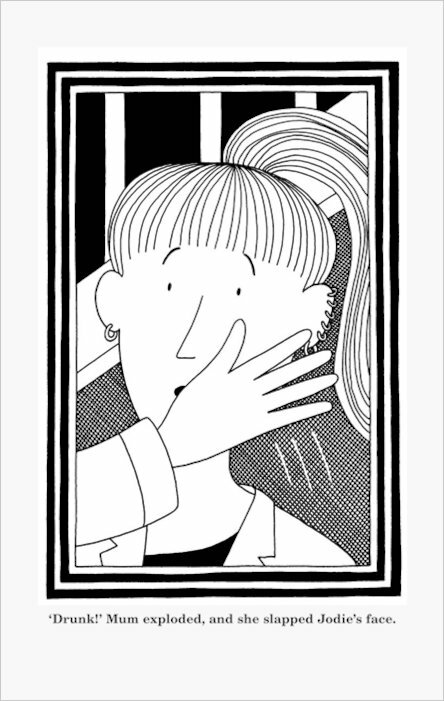 The Wilbur-Forces are the headmaster and his wife – Mrs Wilbur-Force is in a wheelchair after falling down the tower stairs. The teachers are all really nice, but Miss French and mum don’t really get along! Then there’s Jedd the gardener (or if you want to call him the heartbreaker you can! ), who killed a badger. Because it is so discriptive, I would recommend it to children aged 8 or older. 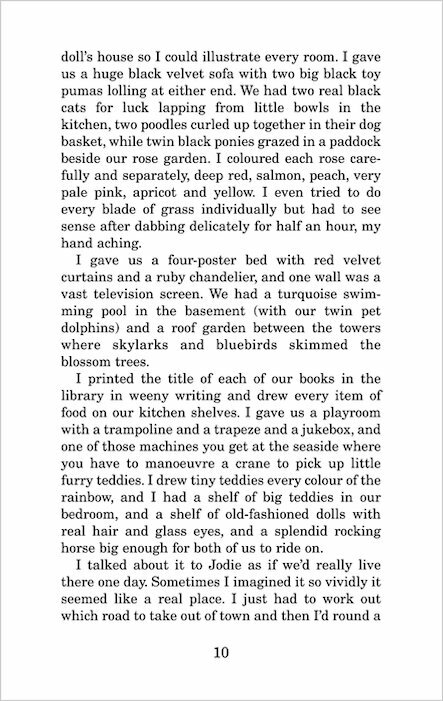 This is probably one of the best and longest children’s books ever. For that reason, and many more, I give it 5 very mischevious, clever joking Jodies. I like Pearl because she’s younger than Jodie,small, shy and anxious. However, Jodie is the opposite, she’s 3 yrs older than Pearl and is bad, Pearl adores her. Their parents get a new jobs at Melchester College(apparently a posh school!) and the girls are suddenly pushed into a new life. I don’t like Jodie very much because she tells Pearl what to do and bosses her around. My favourite part was when they were celebrating Pearl’s birthday and Harley and her stare into each other’s eyes. I relly want to read this is it good after chapter 1? The ending is so sad! 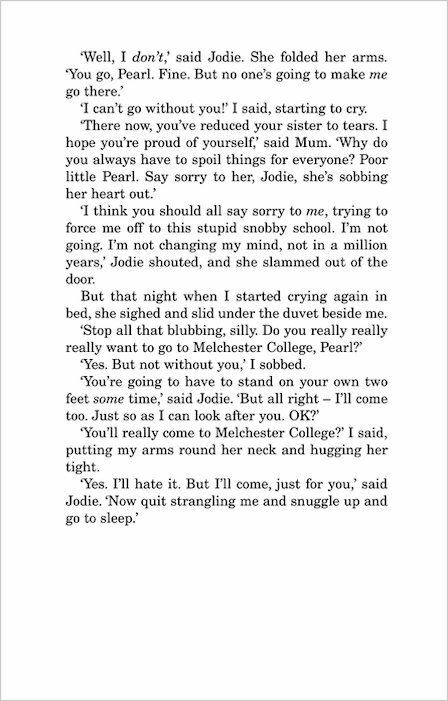 I love the book My Sister Jodie, it was the saddest book I had ever read and I couldn’t help crying,I thought Jodie was the most bubbliest girl I had ever seen. Her behavior struck to me as my own careless self (though I am not THAT rude!) 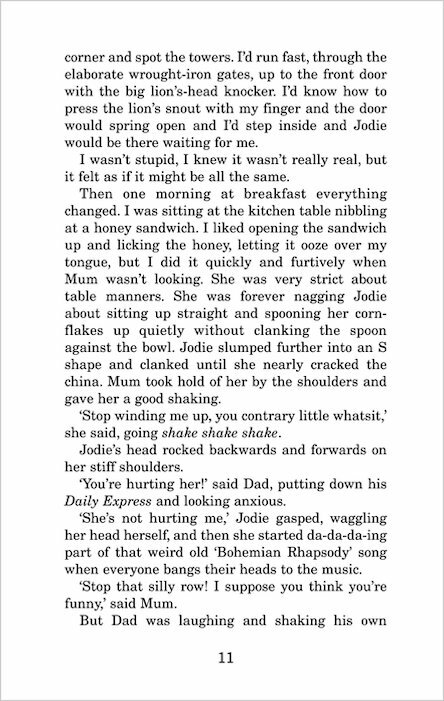 She wasn’t what you would call a little lady, she was more straightforward and frank because on page 17, the ninth line refers to her attitude: Jodie made a very unladylike noise.”We like it here, don’t we, Pearl?We don’t want to go to some awful-jolly-hockey-sticks boarding school” I mean….GREAT! She knew how to stand up when things didn’t go accordingly to HER wishes. As for Pearl,she was an obedient and kind little girl who was faithful to her elder sister. :) I really loved this book and I recommend it to everyone who wants to have a good read. I loved this book sad ending realy didn’t expect that! I haven’t read this yet but I’m preeeeeetty sure it’s going to coooooooooool!!! 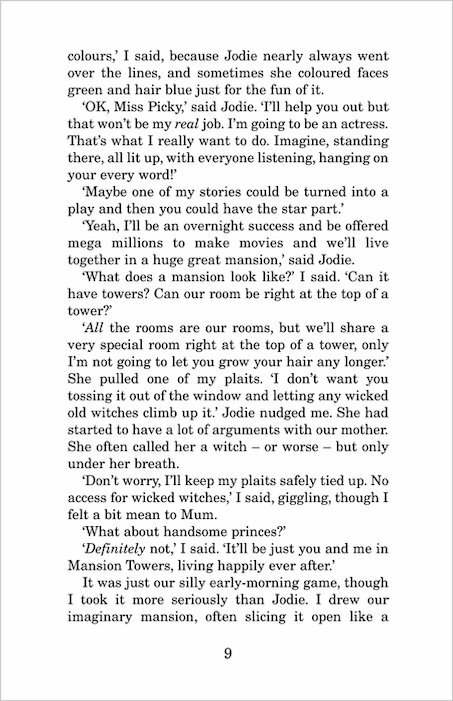 This book is very amusing and has a little of a twist at the end. I found it spooky at times and it totally gav me shock at the end. I think teenagers would be best to read this. 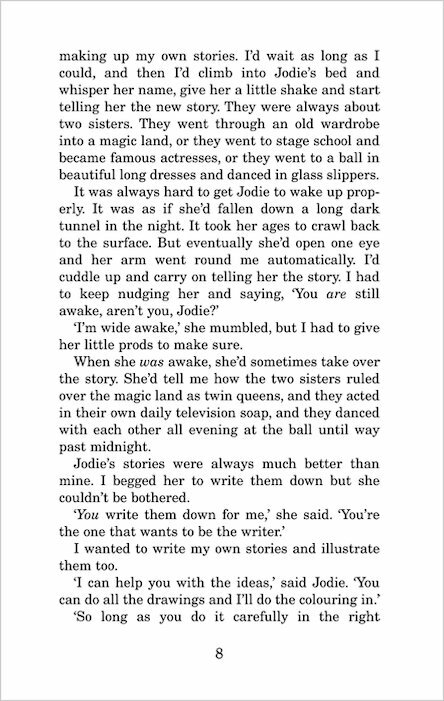 Jaqueline Wilson is a brilliant author. Now I am reading another one of her books, hetty feather. Its my favourite book ever .I dont like Jed,but I LOVE Harley.He likes animals and so do I.
I loved this book. My personal faveroite book out of all the books by Jacqueline i’ve read. This book made me cry! So sad. I l♥ove this book i have readit and it is ANOTHER amazing book by my best auther Jaqline Wilson it is quite sad at the end BUT… i do recomend it! i absolutely loved it! 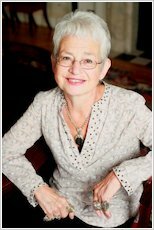 i really like Jacqueline Wilson aswell. it has happy and sad in it which makes it good. OMG!! This Is My Fav Book But My Worst At The Same Time!! I LOVE IT!! Please Just Read The Book!! It Wud Mean A Lot To Pearl If She Was A Real Person! But Ive Read It Twice Now And It Never Gets Old! =[ I Think I Might Cry Now Thinki9ng About It!! I Liked this book but the end is sad! Big Fan of Jacqeline Wilson! This book was amazing, I’m currently reading it a 3rd time! I liked Jodie, and all her dilemmas. One of Jacqueline’s best books yet! This book is great. The strange thing i9s it has a happy beginning and a sad end. I was crying at the end! Thats what Jaqueline Wilson’s books do to you! This book was really good, the end was really sad,(i was crying), even still, I just couldn’t put it down! You just have to read this book! i completely fell in love with this book and its my favourite book by wilson and i think its a healthy helping of tragerdy and comic, its funny yet sad, for those who havent read it, prepare to cry! This book was perfect.It was my first Jacueline Wilson hardback.Jodie was wacky.It was sooooooooooooooo sad at the end.5 stars. 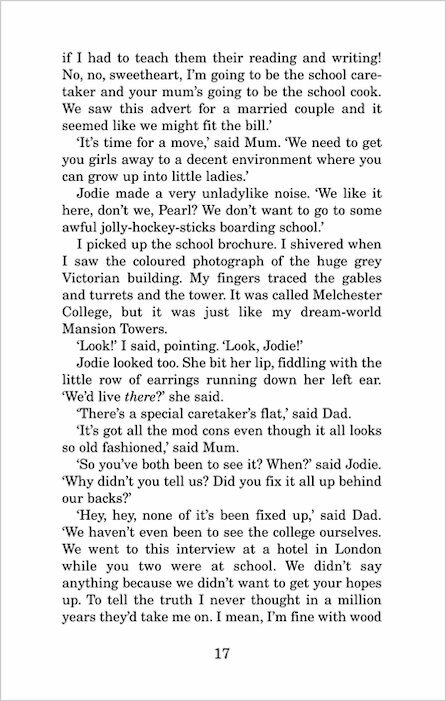 Pearl and Jodie go to to a high standered school caled Malchester Collage. Jodie dose not realy want to go but Pearl wanted to.So for Pearls sake Jodie went. They get up to mystries annd Jodie falls from th tower. This is the best book. But you will be crying your eyes out when you ead the last to chapters.READ THE BOOK AND FIND OUT MORE!!!!!!!! !